Whether your idea of mountain biking is hammering down a single track in the Negev desert or a leisurely ride through vineyards on your way to a wine tasting, Israel Adventure has the experience, knowledge and ability to make your mountain bike tour a dream come true. Israel is a true all season mountain bike destination. In recent years many kilometers of single-track trails have been built, many in areas that include fascinating archaeological sites from Israel’s past. A true challenge is the Israel Bike Trail, now under construction but with many segments already built, which will span the country from the North to South. 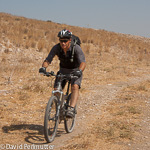 At Israel Adventure we are prepared to make your dream of a mountain bike tour in Israel a reality. We are ready to go whether you bring you own bike or want to rent one of ours. We offer full logistical support to include transportation of bikes and riders, repairs when needed, sleeping accommodations, meals and more.